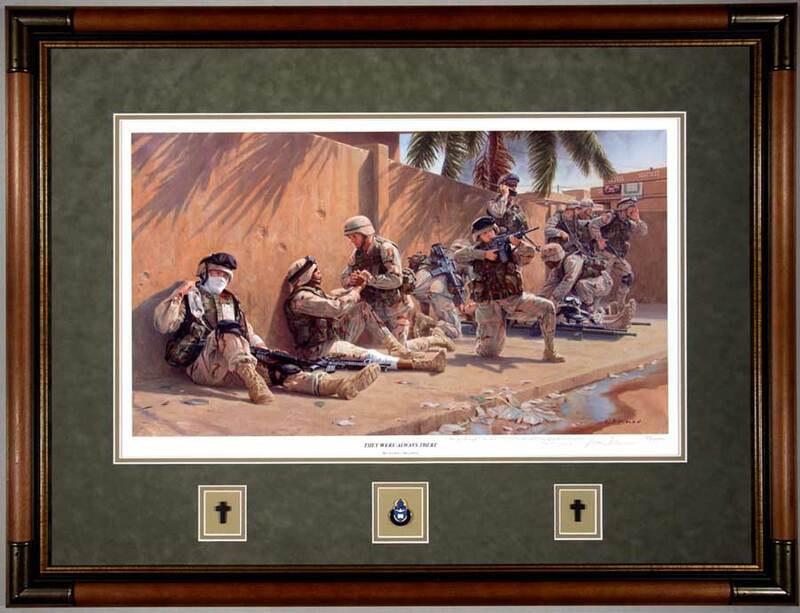 We custom frame military art for a diverse group of soldiers. We specialize in providing that special "touch" to the art. In this example, we have custom cut the mats to include military coins and a custom name plate. Our custom framing includes the use of conservation framing materials to prolong the life of the art and protect against premature aging. This is an example of a completed military art project that included custom cutting the mats to accommodate the chaplain's insignia. The frame is wood with a slight grain showing and metal corner ornaments. This particular mat color and frame combination is very popular among the soldiers. 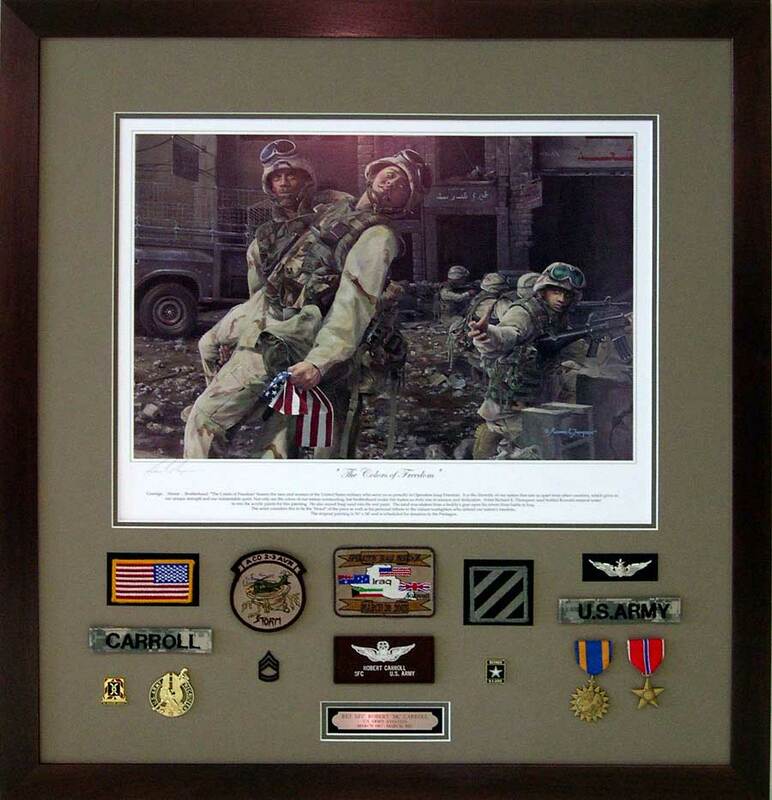 We can include a wide assortment of military patches, insignias, and custom name plates around the artwork. The old solider is contrasted by the new soldier, and a solider's work is never done. This piece is an example of unit patches, coins, insignia, and art all coming together to commemorate a solider's time in the military. We can include a number of pieces around the artwork to compliment the art. Cindy's Custom Framing provides the highest level of quality and service. If you have ideas about the military art you desire to frame, contact us and we will gladly work with you on a custom design. This example includes a number of personal items from the life of a solider, all included with the artwork. Patches, medals, rank, insignia, and a custom name plate are all included beneath the mat. The mats were custom cut in order to display the military items. 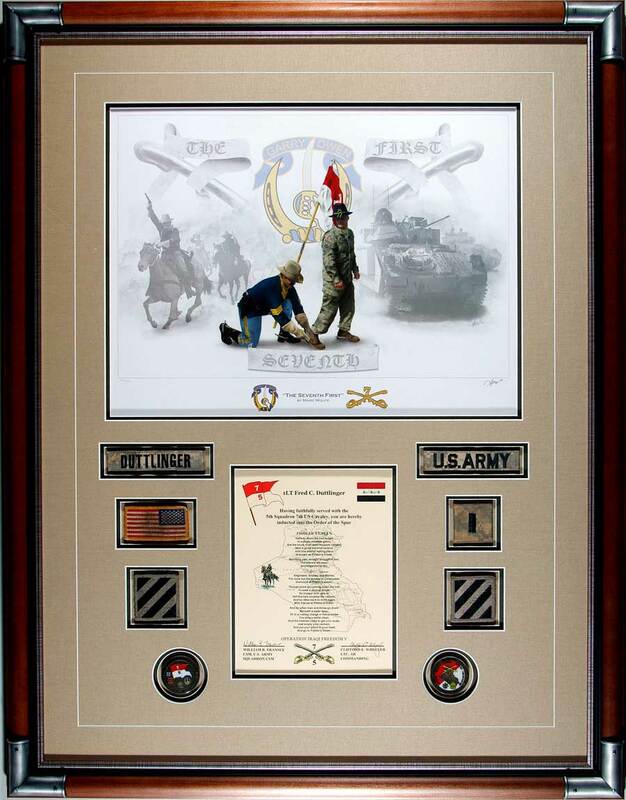 Many of the military art items we frame are given as gifts. We have just completed a page on our Framed Guidon site that is devoted to framing military art. 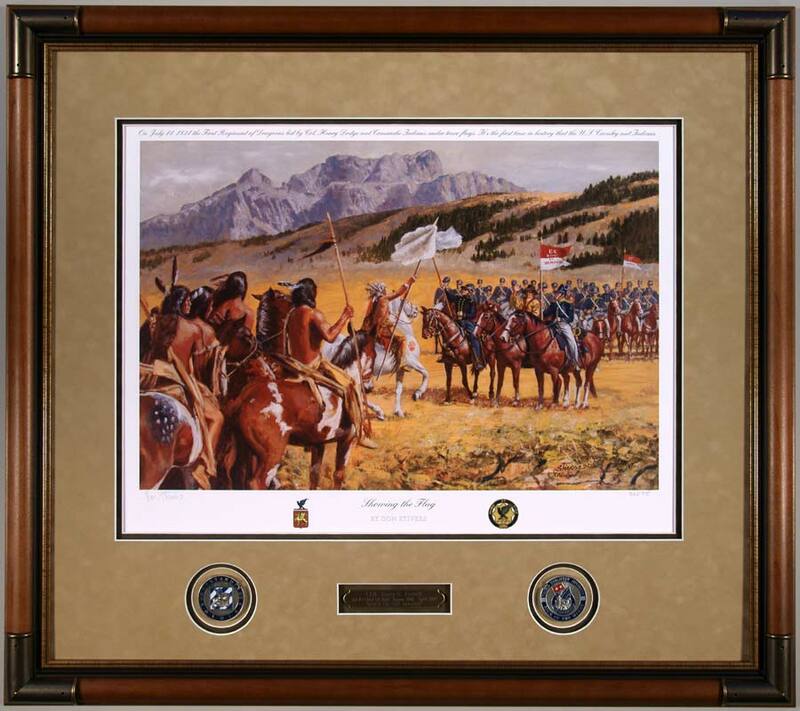 It features examples of military art framed with military memorabilia. The site also suggests designs that positively impact the appearance of framed military art. In addition, there are examples of military photos that use items from a deployment to add personality to a custom picture frame design. You will find them on the photos and prints page. If you are looking for the perfect parting gift for a fellow soldier, contact us, we can help.